The Art Dealers FastTrack Point of Sale (POS) Inventory and Business Management Software Harmony - is designed for Art Dealers and Art Galleries for simplicity and ease of use. The Art Dealers FastTrack Point of Sale (POS) Inventory and Business Management Software Harmony will manage your entire Art Dealer business effectively, efficiently and greatly minimizes your business management time. Perfect for small or large Art Dealers and Art Galleries. The Art Dealer FastTrack Software is rated #1 by Our 55,000 plus Users Worldwide, Trade Publications and Accountants. Ease of Use * Maintains Unlimited Inventory with Pictures * Keyword and Group Searching. * Search by Images * Easily Enter Pictures of your Inventory * Track Sales, Purchases, Expenses, Returns, Profit/Loss, Layaways, Consignment Items, Auction Items, Repairs and Restorations * Track Costs of Purchases, Repairs, Restorations and shows * Over 700 Reports for Sales, Purchases, Profit/Loss, Returns, Auctions, Layaways, Consignments, Commissions, Taxes, Customer Purchase, customer wish list, plus many more (many with thumbnail images) * Print Labels and Price Tags - many with thumbnail images - with Ink Jet, Laser or Dymo 450 Turbo Printer (including Jewelry Labels - Dymo Printer Only) * Print POS (Point of Sale) Receipts, and Invoices for Sales, Returns and Layaways with Ink Jet, Laser, Star TSP 100 or Dymo 450 Turbo Printer * Bookkeeping/Accounting Module * Auction Watch Module * Ability to Load your Inventory on-line with pictures - no web site needed and free shopping cart (subscritpion service) * 25 plus Renameable Fields * Automatically Calculates Sales Tax *Add your own Logo * Tracks Quantity * Method of Payment Tracking including split transactions * Does Appraisal Memos, Consignment Agreements, Commission Agreements, Layaway Agreements, Gift Certificates and Catalogs * Automatically Calculates Sales Tax for Single or Multiple Locations * Sales Tax Reports * Do Reports by Day, Month, Quarter or Year for Sales, Purchases, Profit/Loss and much more * Show Check List and Calendar * Ability to Charge Customers Credit Card Fees * Calendar Reports (by day, month, quarter or Year) for Sales, Purchases, Profit/Loss and much more * Commission Reports * Layaway Reports * Track Items Missing, Damaged or Stolen * Calculates Change * Auction Reports * Items Out for Exhibition * Built In Margin and Mark Up Calculator * Multi Level Password Protection * Abilty to Delete Sales Worksheet (password protected) * Phone and Address books (including the Internet - Internet access rqd) * Set Up Consignment Discounts based on Date Item is Received and discounts will print on price tags based on Date should you desire it * Track Customer Interests * Phone and Address books * Dial or E-mail your Customers and others Directly from the Software * Automatically Calculates Mall Costs Expenses, Credit Card Fees and Commissions * Consignment Reports * and many other features not listed. 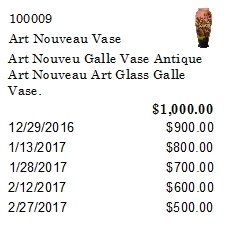 The Art Dealers FastTrack Point of Sale (POS) Inventory and Business Management Software Harmony tm is built to manage your business effectively, efficiently and with detail by the Art and Antique Information Network, Inc. (A.A.I.N.). If you're afraid of computers, feel you are computer impaired - you will especially enjoy the ability on how easy it is to master the software. It comes complete with a step-by-step pictorial Walk-Through guide. The Art Dealers FastTrack Point of Sale (POS) Inventory and Business Management Software Harmonytm provides managed tracking and reporting in Real Time, which gives you quick accessibility to your inventory and its growth. The Art Dealers FastTrack Point of Sale (POS) Inventory and Business Management Software Harmonytm is priced at $339.95 (there are no add'l fees for network licences). 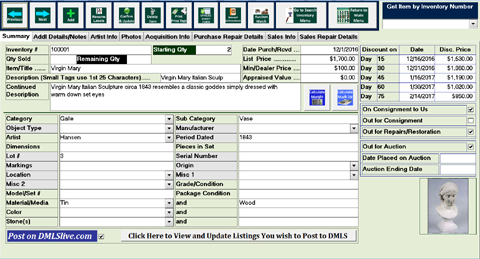 The Art Dealers FastTrack Point of Sale (POS) Inventory and Business Management Software HarmonyTM includes powerful search and report capabilities. Security is built-in with password protection for your different managerial levels. 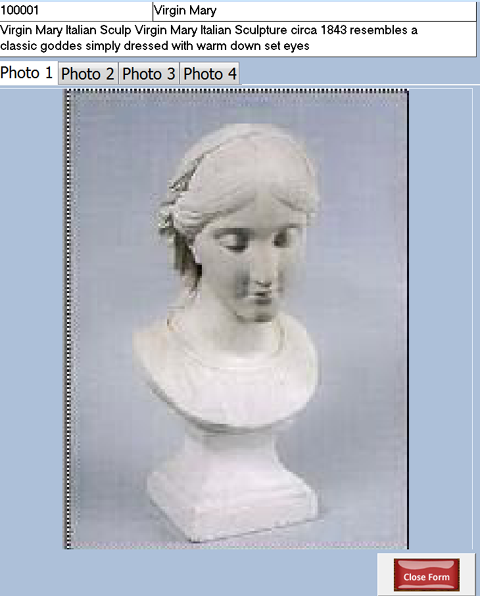 List and Track an unlimited number of Arts, along with information and pictures of each item. 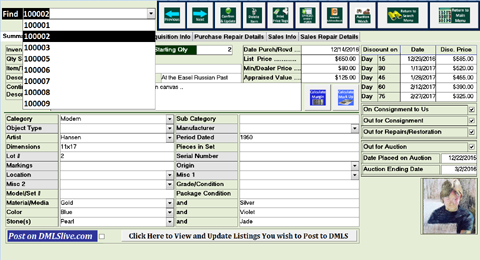 Inventory is easy to view in tabbed folders defining each individual item with a detailed summary description, pictures, purchase history, repair and restoration information and sales, with associated financial information. 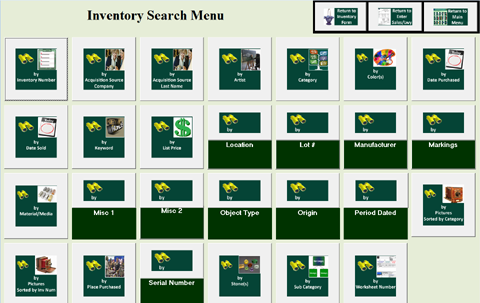 Search by Keyword, Group or Image to Locate your inventory, with all its information-- there are multiple ways to retrieve your merchandise. Retrieve matching results instantly. 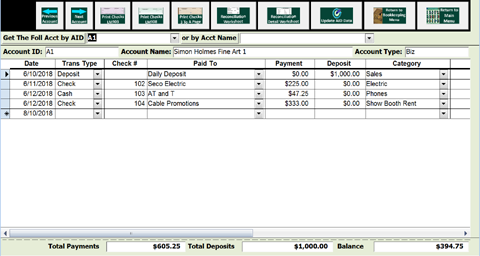 Track all your business expenses with our Bookkeeping Module. 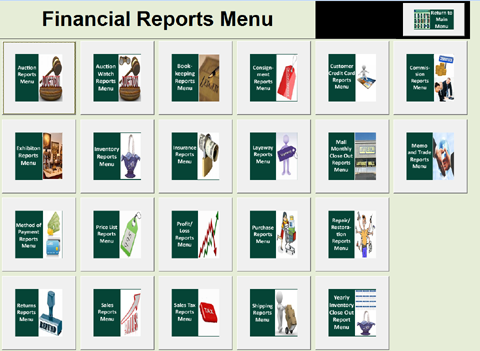 Reports (over 700 built-in) help you manage your business efficiently and effectively. 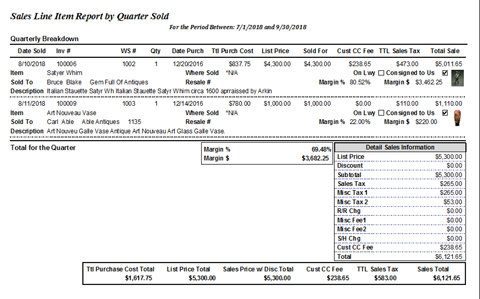 Automatically generate: Sales, Purchase, Profit/Loss, and Bookkeeping including Point of Sale Receipts and Invoicing (with either a Ink Jet, Laser, Star TSP 100 or Dymo 450 Turbo Printer), Price Tags &, Merchandise Labels (with either a Ink Jet, Laser Jet or Dymo 450 Turbo Printer), Appraisal Memos, Authenticity Certificates, Consignment Agreements, Commission Agreements, Layaway Agreements, Gift Certificates, Customer Interests, Inventory, Financial reports and more. 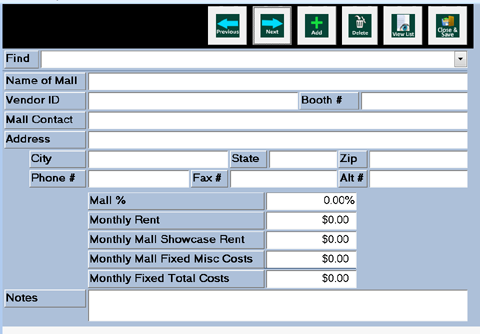 Generates Mailing Labels Financial Tracking of shows. Creates Check lists for your shows. Many other built-in reports as well. 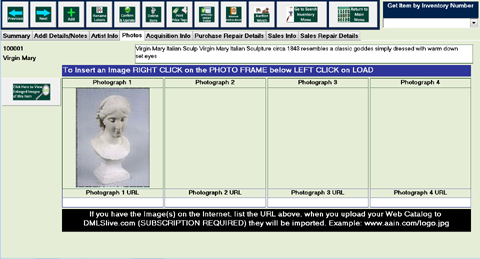 Produce detailed reports Items out for Consignment, Auction, Repair or Restoration including the costs involved. 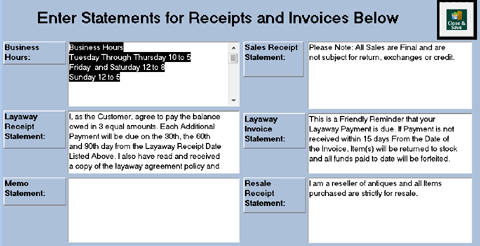 Track and Calculates Sales Tax (this can be done for a variety of tax locations that you can add). You have the option of charging your Customers a fee for credit card payments and passing the charge to them. Change Terns that appear on you receipts and invoices. They can be edited anytime to reflect special notes such as "Come back for our Big Bang 4th of July Sale". Maintain complete information about your customers including tracking items of interest and show codes for sorting mailing labels. 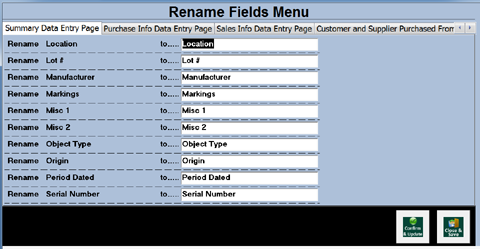 Define your own fields such as Categories, Object Types, Manufactures and more. 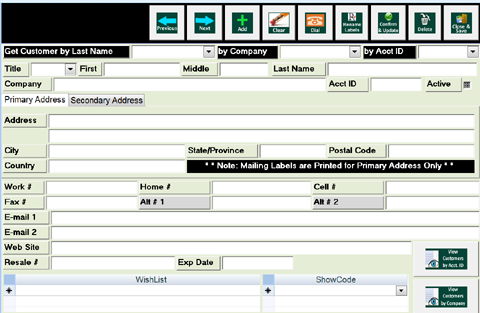 Over 25 Select Field Labels can be renamed which will change on all your forms and reports to bette fit your individual inventory and business needs. Set up and print employee schedules. Directly go to internet resources and services directly from the software such as DMLSLive, Antiqnet or EBay of your choosing. Add Unlimited addresses. Auction Watch allows you to track on going auctions you are involved with to secure items. 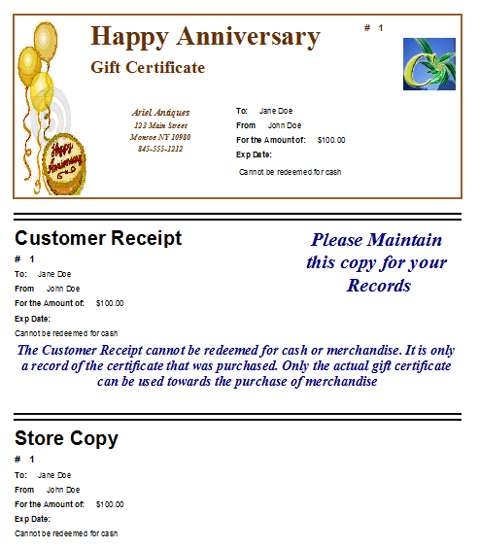 The Art Dealers FastTrack Inventory and Business Management Tranquility Software tm has built-in Gift Certificates you can Create and Print (a variety of over 40). 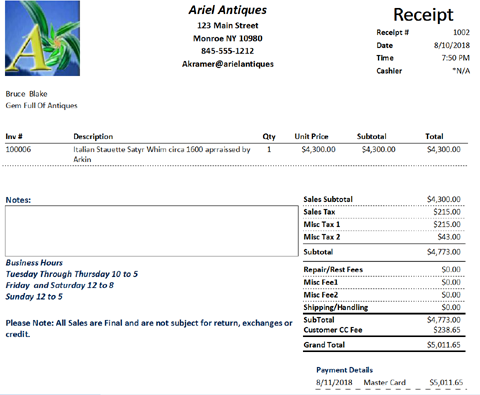 You can set up Price tags to print with or without dated consignment discounts in a variety of sizes for your inventory (most sizes with a thumbnail image of the item). Multi-Level Security, password protected by you, the dealer, who controls access to both the system and its private administrative functions. Password-protected access to your sensitive areas. Multi-Level Security. Show Check Lists, Planners and Calendars. Menu Driven/Point and Click operation. It eliminates repetitive typing. Pictorial Walk-Through Guide quickly familiarizes you with using the software. FREE Technical Support for 90 days. Personal attention given to assist you on any questions and needs you might have. Optional Maintenance Contract available for continued technical support. We are confident that you will find The Art Dealers FastTrack Point of Sale (POS) Inventory and Business Management Software Harmonytm a valuable investment at an inexpensive price. We offer a FREE FUNCTIONAL EVALUATION COPY. To receive your FREE FUNCTIONAL EVALUATION COPY contact The Art and Antique Information Network, Inc. (A.A.I.N.) sales department by phone (1-352-259-4779), by E-mail sales@aain.com , by clicking on "Order Free Evaluation Copy" link listed below. 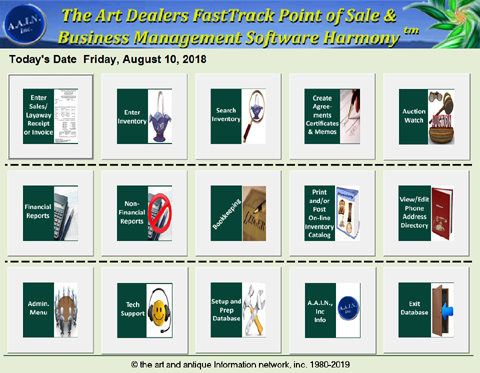 Recommendation: The Art Dealers FastTrack Point of Sale Inventory and Business Management Software Harmony TM will run best on an Intel I7 or AMD based, AT- compatible PC with a Super VGA monitor.